The agreement on the headquarters of Transport Community Treaty Permanent Secretariat has been signed today in Belgrade. 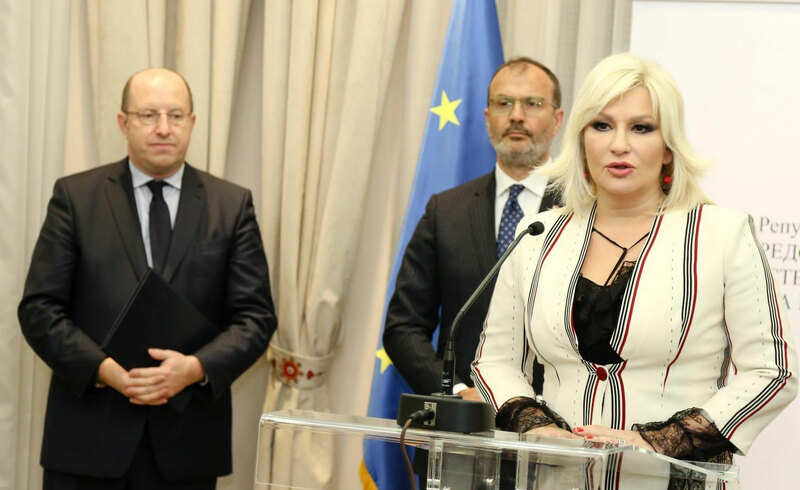 The Serbian Vice Prime Minister and Minister for Construction, Traffic and Infrastructure, Mrs Zorana Mihajlovic and the newly appointed interim Director of the Permanent Secretariat of the Transport Community Mr Alain Baron signed the agreement, in the presence of the Head of the European Union Delegation to the Republic of Serbia, Ambassador Sem Fabrizi. The South East Europe Transport Community has been established in October 2017, following the signing on a Treaty on its creation on 9 October 2017. The aim of the Transport Community is development of transport network between the EU and countries of South east Europe – Albania, Bosnia and Herzegovina, Former Yugoslav Republic of Macedonia, Kosovo*, Montenegro and Serbia. The seat of the Permanent Secretariat of Transport Community will be in Belgrade and is expected to open physically in few months. On the occasion of today’s signing ceremony, Ambassador Sem Fabrizi said that the “decision to have Belgrade as seat for the Permanent Secretariat of the Transport Community represents a great opportunity and responsibility for Serbia”. “Today’s signature of the Headquarter agreement is another important step in implementing this Decision and I congratulate the interim Director of the Permanent Secretariat of the Transport Community Alain Baron and the Deputy Prime Minister Mihajlovic for their commitment”, he said. Ambassador Fabrizi underlined that establishment of the Transport Community is of significant importance for the integration of transport markets of the South East European partners into the EU transport market: “It is a part of the ‘connectivity agenda’ improving transport, energy and digital links within the Western Balkans and with the EU, which has been endorsed and supported by the EU from the start. This is a key factor for growth and jobs and will bring clear benefits for the region’s economies and citizens”. He reminded that only in the past 7 years, the EU has made up to 5 billion EUR of investments in the transport sector in the Western Balkans, of which thee construction of the new Zezelj bridge and e on-going modernisation of the Nis-Dimitrovgrad railway are among the last most emblematic and visible successes in Serbia. “But it goes much further than that: great impacts of EU – Serbia and Western Balkans cooperation is when we deal with technical standards, interoperability, safety, security, traffic management, social policy, public procurement and environment, progressively aligning practices within the region and with the European Union highest standards. This is what the Transport Community will deliver and it will have crucial impacts on speed, quality, price and effectiveness of transport for citizens and businesses”, Ambassador Fabrizi concluded.